Who lives in a pineapple under the sea???? Sponge Bob Square pants of course!! 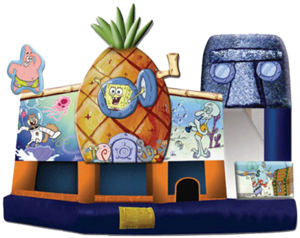 This Sponge Bob 3D 5-n-1 combo-style bounce house is the ultimate in inflatable jumpers with a large jump area, basketball hoop,pop-ups & obstacles. This unit can be rented wet for an additional $30.